i LOVE patterned pants. can't get enough.. and i couldn't resist this pair.. for ONLY $12.95 from h&m. oh thank goodness h&m finally opened in Houston.. now if they only had it at a closer location. so easy to look put together for day or night. also i didn't mean to be so matchy matchy.. but it just ended up that way. and it's fine. I just bought these same pants and have been plotting how to wear them for their debut. I love them on you here with the slouchy top! Wow, that’s so beautiful. Nice color too. Wow, your pant is charming and looks so beautiful. I also like the bag idea. love those pants, can't believe they were under $15! The unintentional "matchy matchy-ness" of the this ensemble is definitely serendiptious! 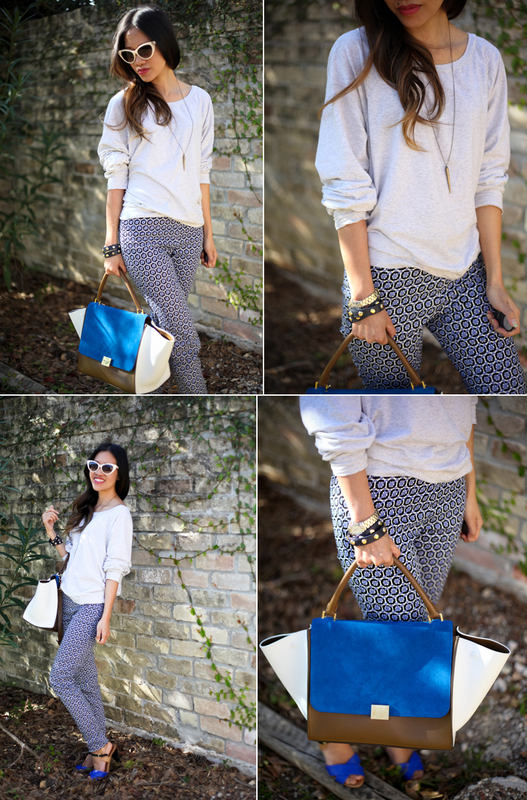 :) Love the pants, Issa and of course that bag has got me drooling! :))) Hope you've been well, lovely.